Painted version is painted with tough polyester powder paint for a lasting finish, even after machining. Paint is only applied to the exterior surface. Black screws are included to enhance appearance. Four (or 6 in 1590D, 1590DD & 1590E, 8 in 1590F) 6-32 x 1/2” stainless steel machine screws secure lid - into factory tapped holes. 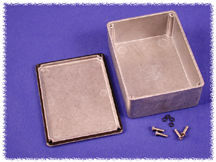 This series is the same as our 1590 diecast aluminum except with a bead of rubberlike silicone around the perimeter of the lid.